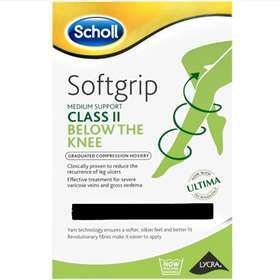 Now made with Ultima technology for a softer, silkier and more comfortable feeling. These luxurious looking and feeling stockings allow them to be put on more easily than standard compression hosiery. 1x Below the Knee Compression Hosiery. Class 2 compression (18-24 mmHg British Standard). Use as advised by a healthcare profession. To ensure the stocking lasts make sure your fingernails and toenails are free from rough edges that could snag the tights and cause ladders and holes. Remove any jewellery that could catch on your tights. It is strongly recommend that you should have a full holistic assessment done by a nurse or doctor before wearing compression hosiery. You need to be measured by a healthcare professional for comfort and positive effect.